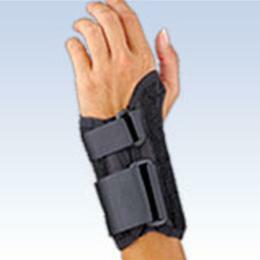 ProLite® Low Profile Wrist Splint 6" Series 22-470XXX :: Orthopedics :: FLA Orthopedics Inc. Provides stabilization to weak or injured wrists in a low-profile 6" design that has less bulk. Constructed of open cell foam with interlock polyester cover for a cool, breathable alternative to neoprene. The low contour at the palmar crease permits full finger dexterity and improved grip strength. A breathable spandex insert ensures a proper fit and easy application every time. Straps are adjustable for compression control. Specify right or left. Color: Black. Measure around center of wrist.